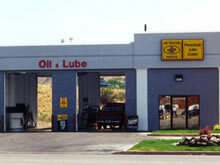 A two bay oil change facility with a unique exterior design finished in stucco. This is one of our more striking designs which we are extremely proud of. Use of the design build concept enabled us to keep the project in budget, and produce a fine facility.